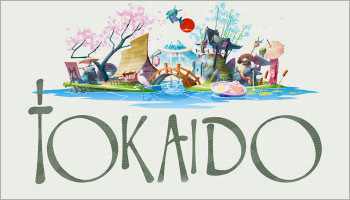 Tokaido is a minimalist game about a journey in Eastern Japan during the Tokugawa dynasty. While traveling, the players meet people, taste meals, collect beautiful souvenirs, soak in hot springs, see great panoramas, enjoy enriching encounters and visit temples and wild places. The action track gives players the choice of whether to travel more slowly (to do more with their vacation) or to run ahead and get the best stuff. Some action spaces let you collect money or award points. The player who made the most memorable journey becomes the winner.